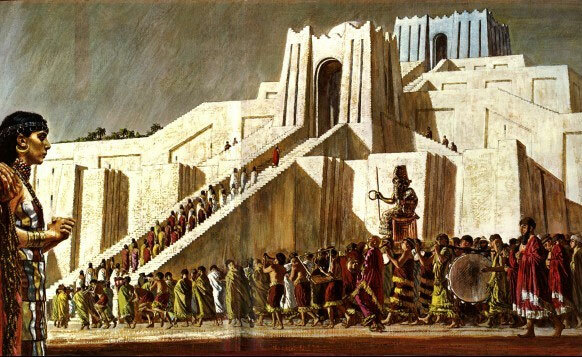 The city of Ur was one of the most important Sumerian city states in ancient Mesopotamia during the 3 rd millennium BC. One of best preserved and most spectacular remains of this ancient city is the Great Ziggurat of Ur. The Great Ziggurat, which is today located in the Dhi Qar Province, in the south of Iraq, is a massive step pyramid measuring 64 m in length, 46 m in width, and 30 m in height. This height, however, is just speculation, as only the foundations of this ancient monument survive today. The Great Ziggurat of Ur consisted of successively smaller platforms that had a solid core of mud-brick which was covered by burnt brick. This outer layer protected the core from the elements. The construction of the Great Ziggurat of Ur began under King Ur-Nammu of the Third Dynasty of Ur (about the 21 st century B.C. ), and was completed by his son, King Shulgi. 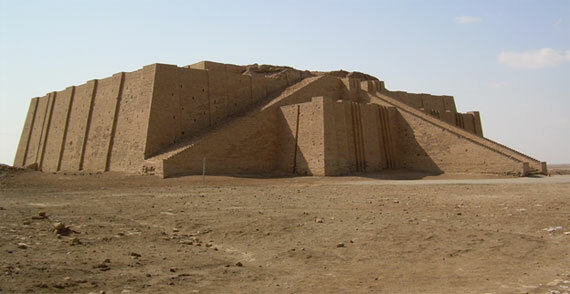 The Great Ziggurat of Ur was located in the temple complex of the city state, which was the administrative heart of Ur. The Great Ziggurat of Ur was dedicated to the moon god Nanna, who was the patron deity of the city. As the Mesopotamian gods were commonly linked to the eastern mountains, the ziggurat may have functioned as a representation of their homes. Thus, the people of Ur believed that their ziggurat was the place on earth where Nanna chose to dwell. Therefore, a single small shrine was placed on the summit of the ziggurat for the god. The people of ancient Mesopotamia believed that their gods had needs just like their mortal subjects. Hence, a bedchamber was provided for Nanna in the shrine on top of his ziggurat. This chamber was occupied by a maiden chosen to be the god’s companion. On the side stairway of the ziggurat’s north western part is a kitchen, which was likely used to prepare food for this god. 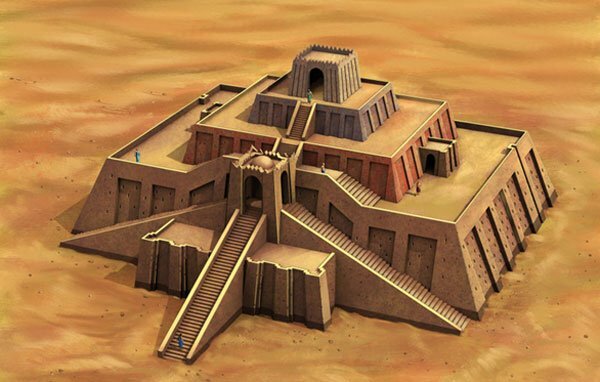 The god’s mortal servants had to be provided for as well, and the outer enclosure of the ziggurat contained a temple storehouse, the houses of the priests and a royal ceremonial palace. During the 48 year reign of King Shulgi, the city state of Ur flourished like never before. The city of Ur became the capital of an empire that controlled a large part of Mesopotamia. In order to gain the allegiance of his newly conquered city states, King Shulgi needed something to unify these different entities. Thus, he decided to introduce a new god that everyone could worship, namely himself. In addition to his self-deification, King Shulgi became a patron of the arts. This was a strategic move, as poets and scribes were commissioned to write about the king’s prowess in various aspects, including hunting, warfare and music. After the death of King Shulgi, however, Ur began to decline. As his sons were incapable of holding the empire together, it soon fell apart, and the city of Ur itself was sacked by the Elamites. After this, a succession of foreign kings ruled the once mighty city of Ur. Ur’s fate changed once more during the 4 th century B.C. This time it was the work of nature rather than man that caused it. When the Euphrates River changed its course, the city was abandoned, as it lacked irrigation. As a result, Ur was erased from human memory. In the 19 th century, however, European exploration in the Mesopotamian region brought Ur and other ancient city states back to the knowledge of mankind. Excavations were carried out, and the remains of the Great Ziggurat of Ur were rediscovered. Since then, extensive restoration work has been carried out to bring back the magnificence of this ancient structure. As of today, the site is still closed to the public, though it is hoped that it will be reopened someday. Perhaps one piece of good news is the fact that Ur is located on the edge of the Tallil Airbase, one of the largest military bases in the Middle East. In other words, the site has been spared from looting, and hopefully we will be able to learn more about the ancient site when it is safe again to excavate in the region. it would be an awesome site to visit in person. i like the part about the maiden who was the companion of the god. I wonder how they choose that person...seems like it could have been lonely at times...but i could be totally wrong of course. God good, muslim Jesus Christ, can you please help us getting away from all these US, UK, "christian" and other satanists, attackers and all the other criminals around everywhere and non-where? Middle East keeps the marvelous stone artefacts of the once enlightened Ancient Bulgarians, the people of God Ra AllFather and God Son the Sun Bal - BalGaRians. 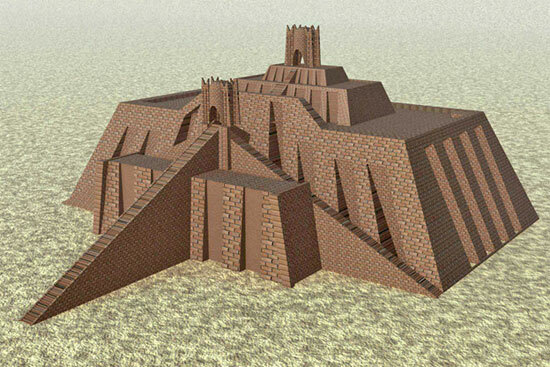 The people of Bal and Ra Balgarians were higly spiritual godly people and their temples are the ziggurats. The very name Zigurat is a Bulgarian name and means For (za) Garati (Garians/BalGarians, people of Ra). What is going nowadays in Middle East has already happened many times in Bulgaria and Balkans during the inspired from outside wars and slaveries - much was destroyed for ever and the history was rewritten in a false manner. This is all the same war against the people of Bal, who suffered the first ever human genocide thousands of years ago. What is that house at the top of the Ziggurats Build?